Sound Pure's dedication to pre-owned products is unprecedented in the industry. We are a small team of dedicated experts that buys, trades, and consigns. We are trusted by customers all over the world. Our curated collection, is thoroughly tested and inspected by some of the best in the business. Our inventory is constantly changing, ever-evolving, with some items sold before reaching the website. Looking for something specific? Have questions about this product's condition or history? Want more photos, or to simply chat with an expert who's had his hands on this actual piece? Contact us now. This one is sold. Don't miss the next one. Some things never even make it to the site so stay up to date on our used collection. We get in many oddities, rare and vintage products, most of which go fast. If you're on the hunt for something specific, something unique, or something priced right, let us notify you on our used collection before the items even hit the site. Want to know if one lands? Want to discuss what's coming? Huge Tone and great clarity - a Big Sounding Guitar !!! 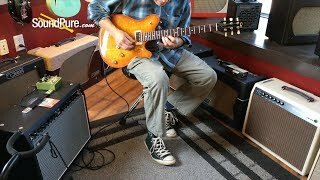 In this video, Sound Pure electric guitar specialist Eddie Berman plays a Michael Tuttle Carve Top Deluxe through a Mesa Boogie Fillmore 50 1X12 combo amp and a Strymon Brigadier dBucket delay effect pedal. For the past two decades Michael has specialized in the fine art of what it takes to make a piece of wood feel good. Michael makes the necks feel like they're a part of your hands from the moment you pick them up. Michael Tuttle's background includes stints with Valley Arts and Don Grosh Guitars, where, among other things, he gained a reputation for his fretwork. As a guitar player for the last 30 years, the transition from a professional musician to guitar builder has been a valuable asset to his company. He built his first guitar in the early 80's and in 1993 started building guitars commercially. After 10 years of honing the art of guitar building working for other organizations it was time to start out on his own. Michael Tuttle Guitars began in 2003. His unique craftsmanship and quality are unparalleled. Once you've played a Tuttle you'll know! We are so fortunate to work with the builders that we represent. Over the years, we've been lucky enough to get on board early with companies that had their act together before the "guitar world" discovered them. Several years back, two people (whose opinions we deeply respect) said we had to check out Michael's guitars. Michael sent us an S and T, and we sold the S model to the first person who heard it! Needless to say, we knew we were on to something. Tuttle has been building for over 20 years and got his start working at Valley Arts in California with Don Grosh, whom he worked with at Grosh Guitars. In 2003, Michael started Tuttle Guitars. Michael's attention to detail is very evident. Being a small builder (Michael’s team consists of himself and an assistant), everything needs to be right the first time out. This is a huge benefit for the player, as there can be no "Monday or Friday" guitars. We’ve always loved it when the guy’s name that's on the headstock had his hands all over the instrument when it was built - his reputation and quality of work is on the line every time one of his creations goes out the door. It's wonderful when you put one of Michaels guitars in a player's hands for the first time and watch their reaction. Michael is such a talented builder, and we are lucky to have such a positive relationship with him as a shop. Neck Back Shape: .850-C, 12"